Mother-in-Law Salsa – ¡Be Careful Sons-in-Law! By the name of this salsa we can sense that some surprise or maybe some tragedy lies ahead. The tradition from Colima says that this is the recipe that the housewives prepared to their sons-in-law when they went to visit... the test consisted in checking how much hotness they could resist. Although the reality is that not everything is horrible in the mother-in-law salsa because in the preparation also many fresh ingredients are used, that give a very good flavor to the whole salsa . 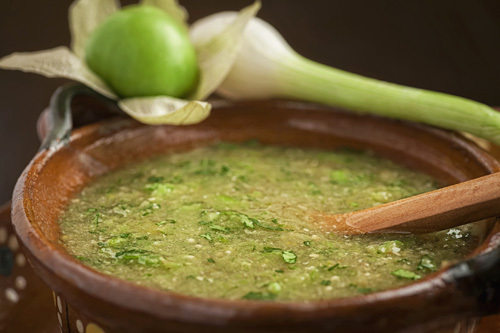 In fact the salsa also has an acidic and potent touch that comes from the tomatillos and the spring onion stalks – some fantastic ingredients. The consistency of the salsa is thick and is perfect to accompany popular homemade meals like a good plate of beans with rice , a grilled steak , a cecina , etc. – You see sons-in-law it did not go that bad, you only have a small test with the hotness of the salsa. Making this recipe is very easy because you are only going to cut and blend. In the preparation 1 tomato is used which still has to be green so its flavor combines better with the one of the other ingredients. To make the salsa also spring onion stalks are used, which have to be in a very good condition. The recipe will be ready in about 5 minutes . Yields 2 cups of salsa. Finely chop 2 coriander sprigs and 3 spring onion stalks; then set aside. Don’t use the part of the stalk of the spring onions, where it starts to separate because it has a slightly bitter taste. The Spring Onion Stalks that were minced. Mix very well the mother-in-law salsa with a mixing spatula. * Since the salsa ingredients are prepared raw , it will last only 3 days in the fridge. Suggestion: If you want to try again the acidic and soft flavor of the tomatillo, in another recipe... you have to prepare the tomatillo guacamole. Did you like the Mother-in-Law Salsa? More secrets about the Mexican salsas. This is a very creative measuring cup that will serve you for many recipes.